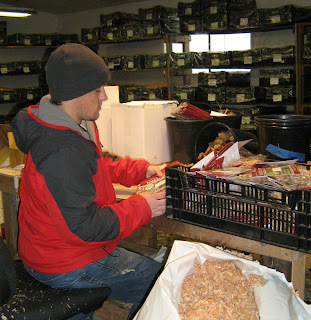 Preparing dahlia tubers for shipping. 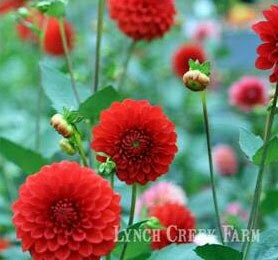 Lynch Creek Farm is shipping dahlia tubers now. When will will your tubers be packaged and sent out to you? Shipping dahlias is done according to planting zones to ensure that your tubers continue in storage in optimal conditions until shortly before the soil in your area is warm enough for planting dahlias. If you live in Florida, Hawaii or Texas, and you ordered early, chances are you already have your tubers; shipping began March 1 to those states. Dahlia tubers are probably on the road now, just after mid-March, to Alabama, Arizona, Arkansas, California, Georgia, Louisiana, Mississippi, North Carolina, New Mexico, Oklahoma, South Carolina and Tennessee. And if you live in any of those states and are just now ordering dahlia tubers, they'll be sent straightaway. On April 1, the crew at Lynch Creek Farm will begin sending dahlia tubers out to growers in Kentucky, Virginia and West Virginia. Shipments to the rest of the country will begin on April 15. Farm personnel are careful to package your tubers so that they withstand varying weather conditions on the road to you and arrive in good condition, ready to plant. But since soil and weather conditions vary within the various zones, be sure your soil is ready before planting your dahlias. Don't plant until danger of hard frost is past, and if it's been unusually wet, hold off for a week or so until the soil dries out, and be sure your planting area is well drained. Not sure when to plant dahlias in your area? Check with your local chapter of the American Dahlia Society; you can likely find a nearby chapter online.